green oasis in downtown Tokyo Akasaka area. of Tokyo's skyline from the 18th to 29th floors. the room for privacy and artworks by local artists. Japanese tradition and culture as its core theme. 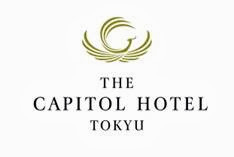 The Capitol Hotel Tokyu is a member of Preferred Hotels & Resorts. Adopting Japanese tradition and culture as its core theme, the prestigious building distils the very best of traditional Japanese architectural principles in a breathtaking contemporary building which will serve as a new landmark for Tokyo. 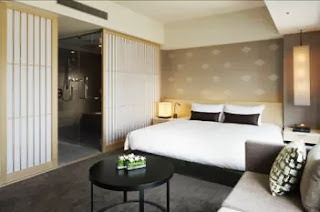 The Capitol Hotel Tokyu is located in a tranquil, green oasis in the downtown Tokyo Akasaka area, overlooking the city's historic Hie Shrine and close to the Prime Minister's official residence. 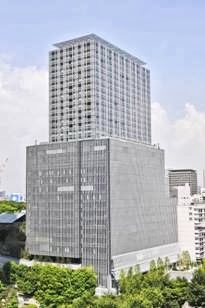 The Capitol Hotel Tokyu is on the site of the former Tokyo Hilton Hotel, which was opened in 1963 in preparation for Japan's hosting of The Olympic Games and became the first global chain hotel in Japan. The hotel was then operated as Capitol Tokyu Hotel from 1983 and closed its door in November 2006. It was for years "the" address in Tokyo, and received many international VIPS and celebrities, including The Beatles during their world tour. The original hotel was demolished to make way for Kengo Kuma's new architectural masterpiece. With latticework-inspired exterior design and graceful interiors, the new 29-storey luxury hotel features 251 guest rooms with panoramic views of Tokyo's skyline from the 18th to 29th floors. Its luxurious facilities include five restaurants and bars, five banquet spaces and two floors of state of the art fitness and spa facilities, including a 20-metre indoor swimming pool, membership gym and jacuzzi. Spacious 45 sq m guestrooms invoke the delicate style of traditional Japanese architecture with 'shoji' paper screen divides and artworks by local artists. There are a total of 13 elegant suites, 4 of them on the 5th floor enabling guests to enjoy the greenery of the landscaped gardens and the picturesque 500-year old Hie Shrine. A Club Floor on the top three floors includes five types of rooms – Club Deluxe King, Club Premier Corner Twin, Club Premier King, Executive Suite and The Capitol Suite – and incorporates a Library Lounge for breakfast or cocktails exclusively for Club Floor guests. Signature Japanese Restaurant 'Suiren' features the best of the country's cuisine serving teppan-yaki, sushi and the fine art of kaiseki in the peaceful surroundings of the hotel garden – and in the garden, guests can have traditional tea ceremonies. Food & beverage venues also include Chinese Restaurant 'Star Hill', All-Day Dining 'ORIGAMI' and 'The Capitol Bar'. 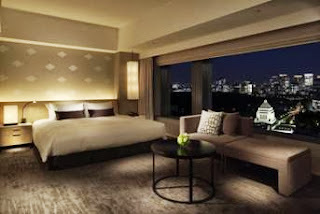 Located in central Tokyo and connected directly to subway stations, the hotel is a convenient venue for events such as weddings, parties, seminars and business meetings. The "Ho'oh" room and Foyer can be combined for spacious banquets and large-scale gatherings. 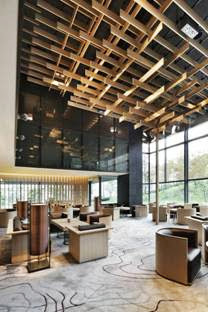 "The Capitol Hotel Tokyu's unique concept marks a sophisticated new era in Japanese hospitality. It is a new type of luxury hotel in Tokyo that adopts Japanese tradition and culture as its core theme," said General Manager Susumu Togashi. Architect Kengo Kuma said: "The question is not how you design the building, but how you design the relationship between the outside and the inside. You do not separate spaces with walls, but you use flexible screens, and you aim for an integration of the building with the garden and the woods. "It's a miracle that such a densely wooded environment still exists in the middle of the city." Many of the local artworks that adorned the original building are still retained including the famous works of Toko Shinoda at her 40s. The old piece is being showcased at the lobby along with a new piece she just did at the age of 97. The Capitol Hotel Tokyu is located within a 10 to 20 minutes subway ride from Tokyo station and the major shopping and dining areas of Ginza, Roppongi, Shinjuku, Shibuya.